"Ensemble de Contrabajos de Málaga"
"Ensemble de Contrabajos de Málaga" en la feria Cemma de la música de Málaga. Welcome We are happy to announce the foundation of BASSEUROPE.org - the European Society of Bassists (ESB). 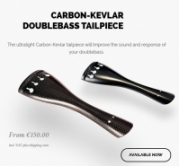 El cordal de carbono-kevlar tiene un peso 68grs lo que permite vibrar al puente libremente y con mayor rapidez, mejorando la respuesta del arco, sustain y el volumen general del instrumento. Zyex synthetic core strings produce an extremely warm, rich sound. Zyex strings are made from a new generation of synthetic material, creating strings that are incredibly stable under drastic climatic conditions. Kaplan double bass strings are aimed at the most discerning orchestral musicians. 28240 Hoyo de Manzanares, Madrid. Con el objetivo de ofrecerle el mejor servicio, todas nuestras visitas son concertadas bajo cita previa. Lunes a viernes de 8:00 a 15:00h. Line 611A, Moncloa (Madrid) - Hoyo de Manzanares. Stop : Urbanización Las Colinas. From Madrid: Motorway A-6, take the exit at Km. 29 towards Hoyo de Manzanares M-618. Keep driving for 5 Km on the M-618 until the next roundabout (Petrol station Cepsa) and turn right into Urbanizacióm las Colinas. Located only 2 kms away from Hoyo de Manzanares village centre, Seccion Contrabajo offers excellent parking facilities with easy access to our workshop and showroom. Copyright © 2019 SECCION CONTRABAJO. Todos los derechos reservados.